What's the difference between the balms? This is a regular question and we can answer by this table. Yes we do sample packs of FEG balms - they come in our three varieties - Original, Arnica and BUMP. Original Sample Pack - 4 Balm samples and some tea. How do I use the balms? Gently rub the balm with the pad of your index finger or scrape a little out using your finger nail and gently apply to the skin and massage. The balm will spread with the warmth of your skin. Some people feel noticeable benefits after 20-30 mins, other people might take a few applications. If you’re trying the samples, allow a few applications - don’t just write us off after one application. Is it just for Elbows? No, you can use this externally, on any part of the body (but avoid the eyes and genital areas). If you have a reaction, contact us and we’ll find out what exactly it is. If you’re known or likely to be reactive to any of our ingredients, don’t use the product. Social media is good but we think that contacting us directly is your first step. How long will each balm last? 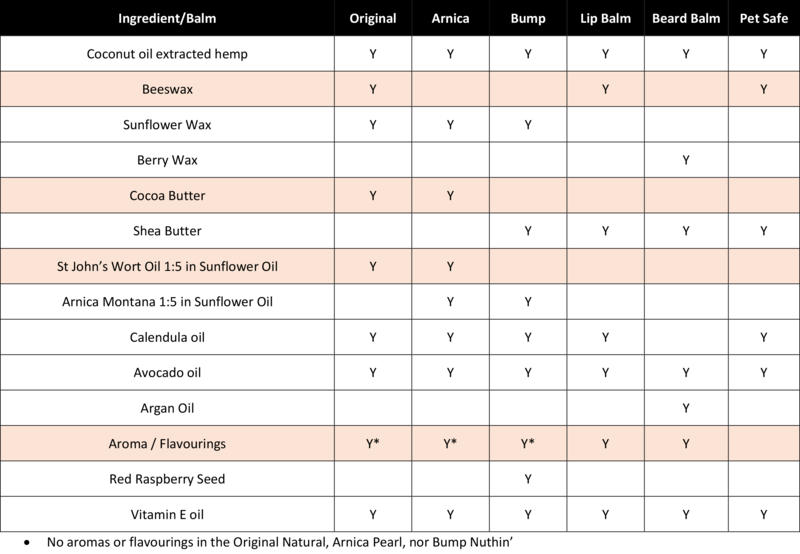 The shelf life of each balm is about 15-18 months. We add Vitamin E oil to help preserve it. Our balm 'blooms' in cold conditions, so if it's been a cold van, sorting office, distribution hub or cargo hold, if might look cloudy on top. The cold wont affect the make up of the balm so just warm it up with your finger. This is simple to rectify. Just pop the lid back on and use the palm of your hand to warm the of the lid for a few minutes. Gently unscrew the lid and check if this has released the stick of balm. If not, retry. Any problems, just give us a call. About 12 months based on the oils, butters and wax we use. How do I make the loose tea? You can use a strainer or a teapot. Add one heaped teaspoon per portion. Add boiling water and allow to steep between 5-15 mins depending on how strong you like your tea. Can I use milk with the tea? Yes you can and it should help the cannabinoids, terpenes and flavonoids in the tea, to attach to the fats in the milk. Using the bag ties, hang the bag of salts under the tap and run the water over and through the bag. Use the entire bag as this is measured for a full bath. This is a one use product. Can I use the salts without the bag? Yes, but you will end up with a lot of vegetation and leaf in the bath. Is St John's Wort dangerous to use with certain medications? Absolutely NOT! We also source companies who do not test on animals too. Most of our ingredients are organic too. Have you checked your email spam folder? Sometimes our emails get stuck in your spam as your privacy or security settings are set to high. It might also be that there's an error in the email you typed in to your account. This can be changed in 'My Account' and you will also see the status of your order there too. Do you dispatch post every day? No. We are a small company and the workforce have production and packing days. These are so we can fulfil orders. We dispatch three days a week. This is in progress as we are able to employ more staff. At busier times of the year we will be bringing in staff to help. I want to return my items and get a refund. We will refund you the cost of any unopened product but will hold the price of the postage, as this service has already been provided. If you don't have an account, please apply here then we'll call you. Please feel free to tell us about any technical issues you think might be hindering your experience. You can do that by email to info@fegbalm.co.uk or by chatting with one of our chat operatives (bottom right hand corner).